Southern Accents has developed a fascination with Pinterest over the past year. We enjoy seeing all the creative ideas, specifically projects that re-purpose salvaged goods, turning them into useful items or beautiful works of art. We appreciate that Pinterest provides a venue for us to showcase pictures of our own creations as well as those of our customers. We have created a Pinterest board titled “Project Spotlight”. On this board we have pinned completed project pictures from Southern Accents as well as many from our awesome customers. This picture was sent to us by Sara Lassiter. 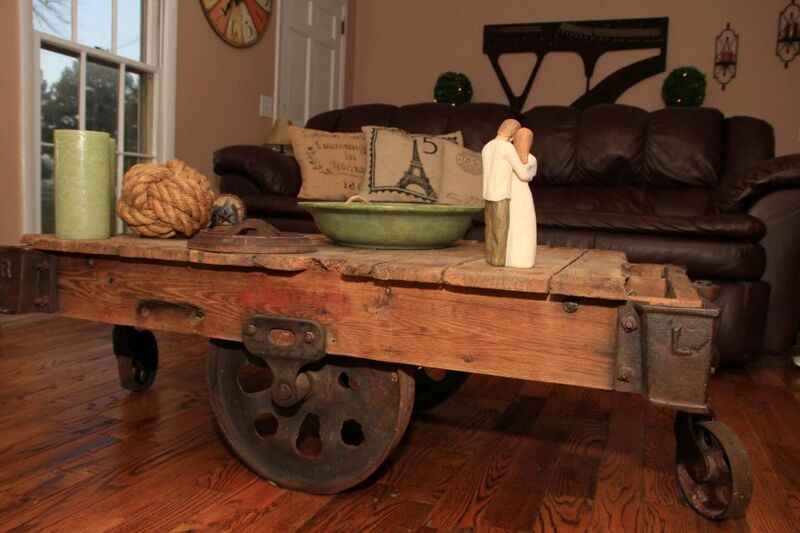 Sara purchased the salvaged industrial cart from Southern Accents and turned it into a beautiful conversation piece. This is one of our favorite finished project pictures! Working in the architectural salvage business, most items enter and exit our store as salvage. We LOVE that our customers browse through our showroom and warehouses and see the beauty and potential of the old, used, often worn items. We get excited when they select a piece and share with us their ideas and vision of what they want to do with it. Unfortunately, we don’t often get to see the finished project. Except… on the occasions when our customers send us pictures of those finished projects! In case we haven’t said this before, we LOVE to receive pictures from our customers! Small piles of salvaged wood turned into a work of art, a spectacular antique mantel that finds a new home, an old door restored to it’s former beauty… seeing pictures of the finished projects inspires us in our continued efforts to rescue these architectural treasures. 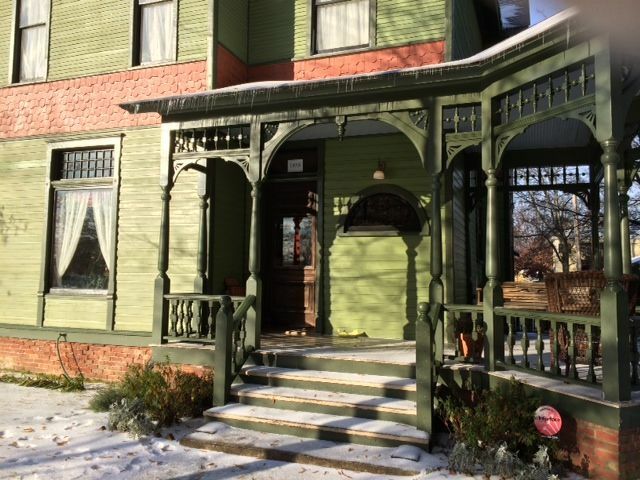 Ed and Laura Sergeant purchased the porch that we salvaged from an 1890 Victorian house in Little Rock, Arkansas and had it added to their own beautiful home. This is another one of our favorite finished project pictures! This past week we have been gathering many of the wonderful pictures that have been emailed to us or posted on our Facebook page this past year. We invite you to browse our Pinterest board and see if you have been PINNED! If not, we invite you to send us your pictures! If you have purchased items from Southern Accents in the past, we want to see pictures of your finished projects. Please feel free to post pictures to our Facebook page or e-mail them to lisa@sa1969.com. Please include your name and any information that you would like to share with us about your project. We look forward to seeing and sharing your work! 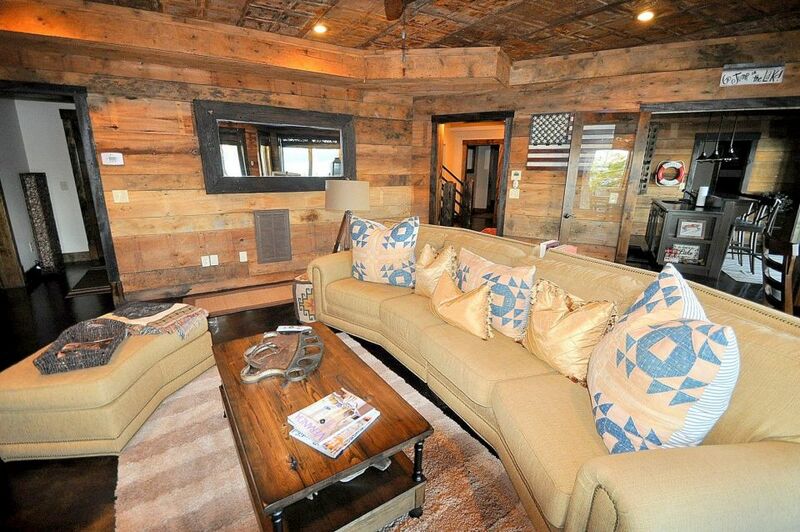 The use of salvaged wood and ceiling tin in Justin Dyar’s lake home blew us away! 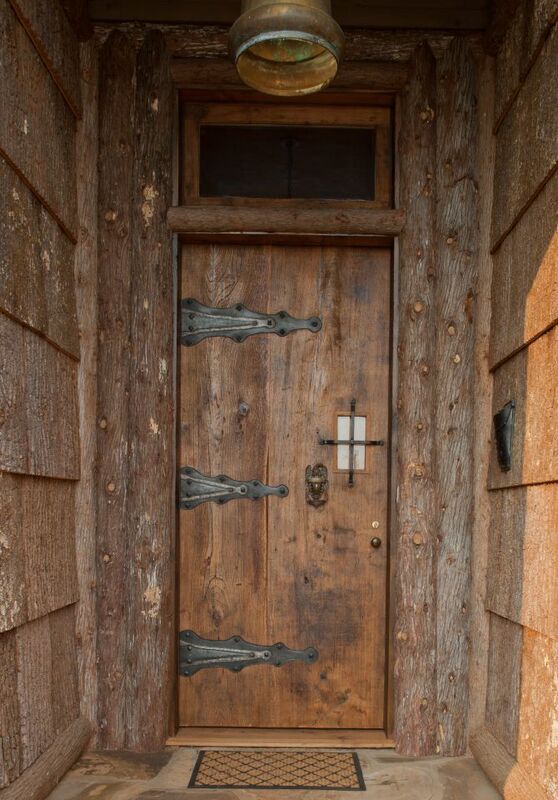 This magnificent door was custom built by Southern Accents from a slab of salvaged wood for customer Ann Pollard. When thinking of architectural salvage, the first thing that comes to mind are all the large architectural pieces like doors, mantels, ornate gingerbread and large columns. When Southern Accents salvages any property, we do our best to take every usable item that can be safely removed from the building. This includes hardware. Naturally, we take all the hardware attached to the doors, but we also take it a step further by removing hardware from windows, wall heaters, cabinets, and shutters. 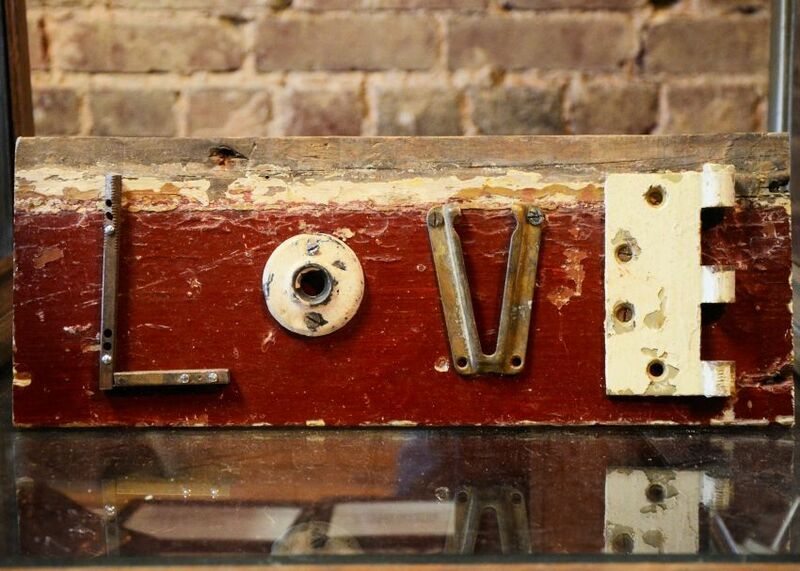 We are continually amazed with all the creative ways our customers reuse and repurpose these salvaged hardware items! 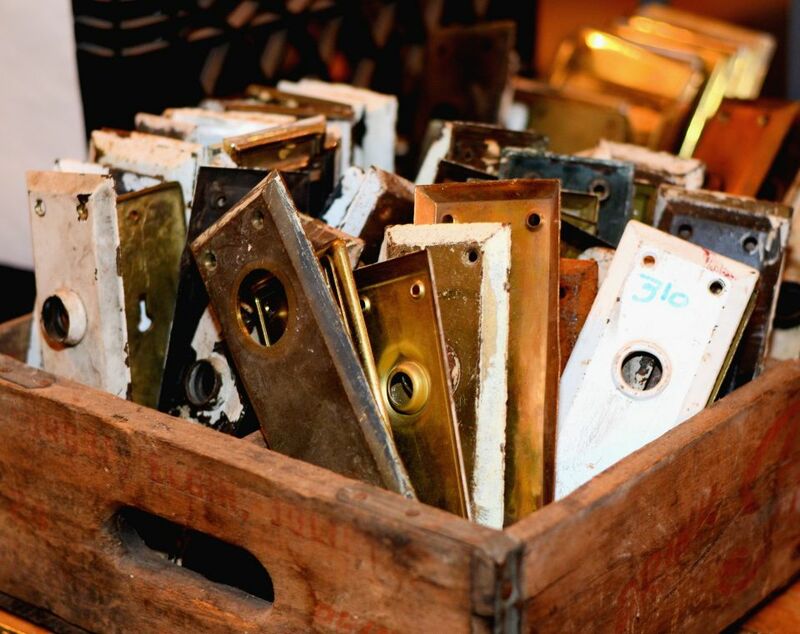 Southern Accents has one of the largest collections of salvaged hardware in the Southeast. These bins are filled with salvaged brass, glass, and porcelain knobs. Walking through our showroom you will see one of the south’s largest collections of hardware on display. While rare, one-of-a-kind pieces may be in a show case, you will also find bins, buckets, and wood crates filled with fun and unusual hardware pieces. 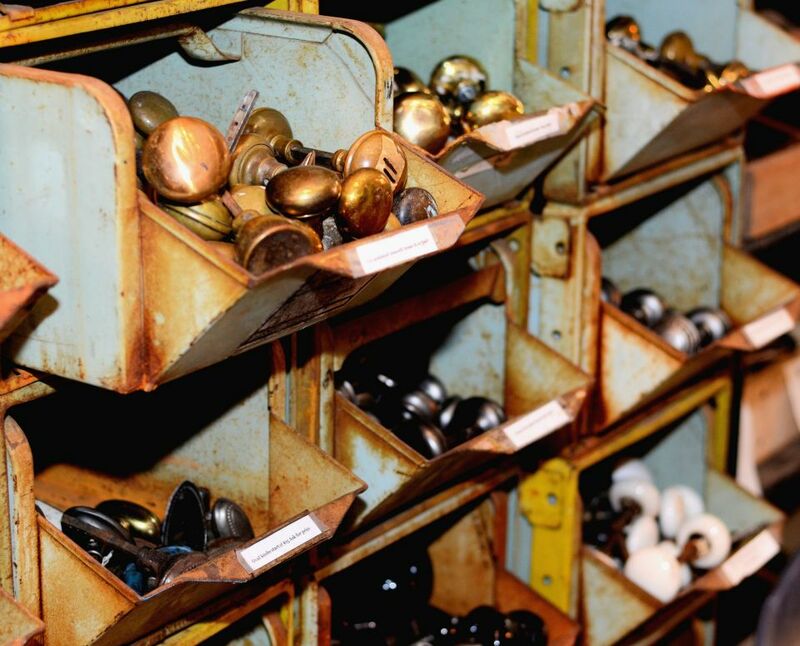 Door knobs made from brass, glass, porcelain and iron are plentiful at Southern Accents. We have hinges that range from a primitive farmhouse style to a solid brass embossed design from the Victorian era. Upstairs our hardware displays glitter with brass door plates in all shapes, sizes, and styles hanging from metal pegs. We delight in watching our creative customers “dig” to find just the right hardware item for their latest project. Scattered throughout Southern Accents showroom are buckets and boxes full of wonderful old hardware! Much of the hardware that we salvage can be cleaned up and reused as it’s original purpose. Customers walk in to our showroom weekly looking for door knobs. They love the vintage look of the old knobs that for many bring back childhood memories of visits to their grandparent’s home. Others relish the thought of contributing to the sustainability of our planet by reusing existing items whenever possible. And then there’s the artistic, crafty crowd that love to take pieces of old hardware, completely repurposing them into wonderful, unique items. Seeing the hardware pieces walk out our door and later return as a piece of stunning jewelry or part of a unique work of art thrills our own creative souls. Mickey Davis is one of several artists who uses salvaged hardware to create unique works of art and usable items. Mickey’s works, along with the creations of several other artists, can be found in our showroom. Stop by our showroom to view our entire collection of hardware. Visit our Hardware page online to view some of our vintage and antique pieces. Browse our Pinterest page to see some of the very creative ways old hardware is being used and repurposed. 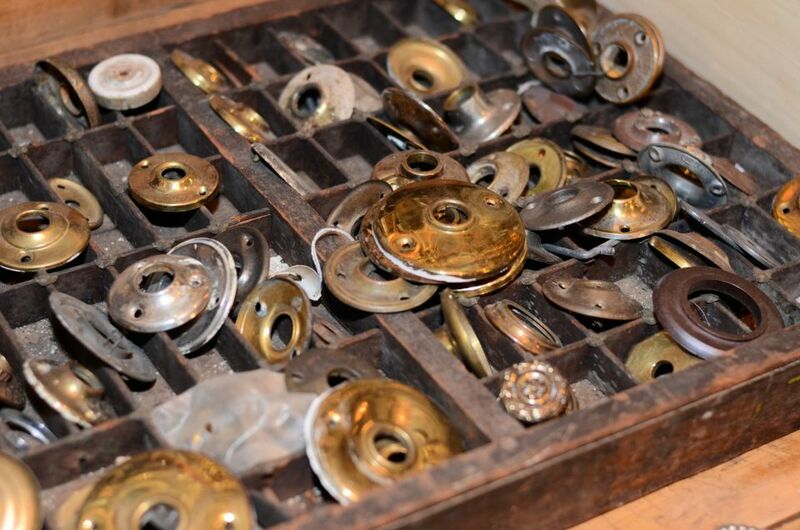 Whether you are looking for knobs, plates, hinges, pulls or just odd bits and pieces… we have a lot to choose from! If you have visited Southern Accents showroom or browsed our website, you have seen all the incredible architectural antiques and salvaged items that we house. Our ever changing inventory is unique, eclectic, artistic and always interesting! What you may not know is that in addition to all the wonderful “old” pieces sitting in our showroom and warehouses, we have assembled a team of incredibly artistic and talented individuals that allow us to offer you so much more than just a showroom of architectural antiques. 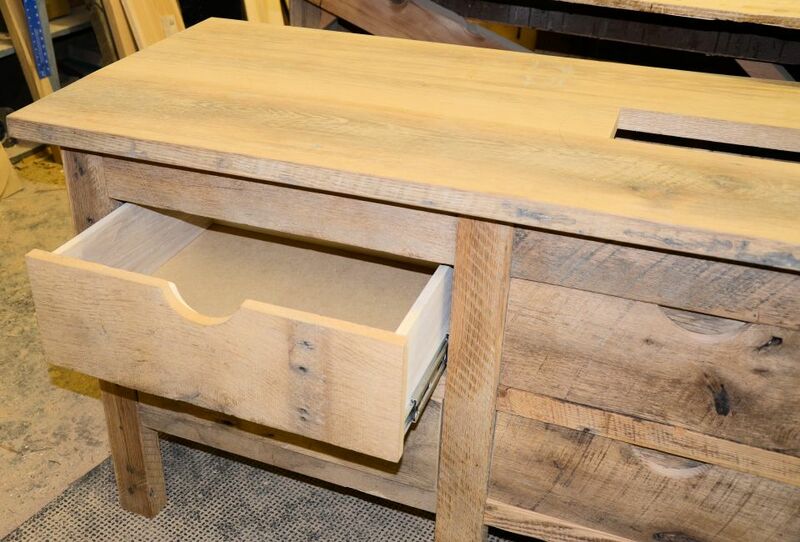 We have the ability to custom make beautiful tables, doors, vanities and more from our growing supply of salvaged wood. 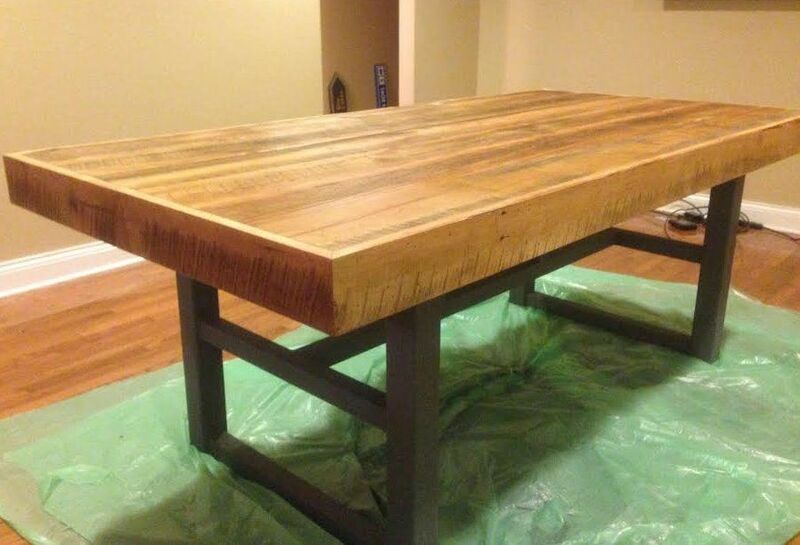 Ryan built this table top for a customer who wanted to combine the beauty of aged, salvaged wood with a more modern industrial base that he already owned. One mile from our showroom sits our salvaged wood warehouse. Salvaged wood has become an increasingly large part of our business. It is highly sought for use as flooring, wall and ceiling coverings. The unique character and patina of aged wood is unmatched. Not only does this wood lend itself to the creation of amazingly gorgeous flooring, it can be used to create stunning, one-of-a-kind pieces of furniture. 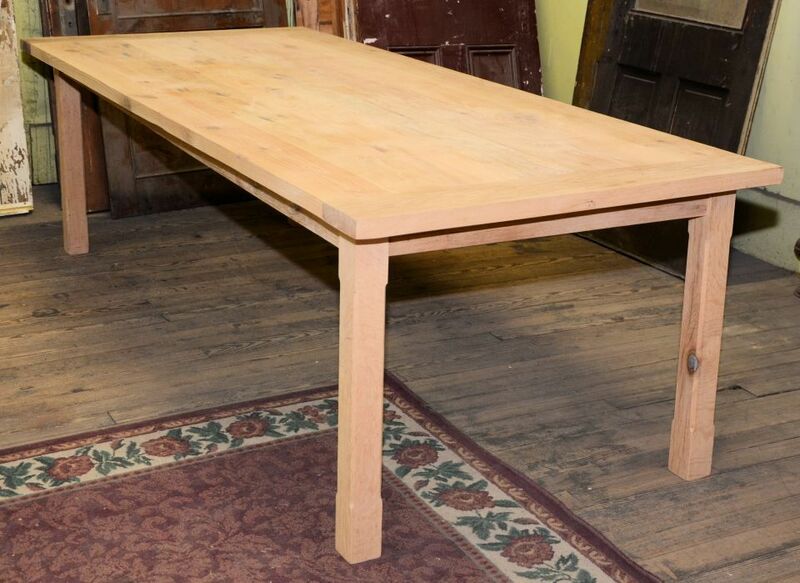 The salvaged wood used for this large table, built by Josh, was planed on all sides creating a smooth finished look that can be stained or painted. Southern Accents has been custom building doors from our salvaged wood for years, but lately we are being asked to build custom furniture items such as tables and vanities. Team members Roger, Ryan, Josh and Wayne all have extensive backgrounds in wood working. The creativity and talent of this team of artists allow us to offer more customized services than ever before! Anyone can walk into a furniture store and pick out a factory made dining room table. What we can create in our wood shop is a one-of-a-kind piece that has character and built in history that will quickly become a conversation piece in your home or office. The tables can be built to your size specifications. The salvaged wood can be planed giving you a smooth finish that can be stained or painted or can be left with the original patina creating a more rustic, distressed look. Each piece is uniquely crafted by one of our talented team members. This beautiful bathroom vanity, also built by Josh, has a copper bowl waiting to be installed on top. The nail holes and circular sawn marks on this salvaged oak gives character to this one-of-a-kind piece. If you are looking for something unique, different, rustic, one-of-a-kind… come talk to us and let us show you what we can do! New Year – New Adventures! 2013 was an exciting year for Southern Accents as we loaded up our truck and hit the road! The year started with a trip to New York where we worked with famed fashion designer Billy Reid, designing and constructing his set for Fashion Week in NYC. Back in Alabama we quickly reloaded the truck and made our way to the Birmingham Home and Garden Show in mid February. Two weeks later we traveled to Huntsville for the Building, Home & Remodeling Showand then quickly geared up for our largest salvage project to date inLittle Rock, Arkansas. The month of May saw us in Montgomery, Alabama for the premiere of the Southern Makers festival. Summer kept us busy as we hosted back to back events here at home:Southern Accents 2013 Alley Party and a day with former Auburn University head football coach Pat Dye. The year ended with us traveling to Atlanta, Georgia for the Haven Conference and then back to Montgomery for Chapel Market. With 2013 in the rear view mirror, we are looking forward to a new year filled with new adventures! This year’s adventure that we are the most excited about is just around the corner! May 3, 2014 will see us return to Montgomery, Alabama for the second annual Southern Makers Festival. Held at the Union Station Train Shed in downtown Montgomery, this year’s affair is already shaping up to be the can’t miss event of the year! Southern Makers is a highly curated festival that brings together the top artists, chefs, breweries, craftsmen, and designers for one fantastic gathering to explore the contemporary side of Alabama’a heritage of textiles, music, craftsmanship and food. Make plans now to attend… you don’t want to miss it! Visit Southern Makers online for all the details. Thank you for following along with us in 2013. We look forward to all that this new year has to offer!